"Powerful enough to fascinate even the most ardent skeptic and raise goosebumps on the arms of the believer...Profound." TOPEKA CAPITAL-JOURNAL Written by bestselling authors Dr. Melvin Morse and Paul Perry, TRANSFORMED BY THE LIGHT proves that those who return from the brink of death are profoundly changed for the better--spiritually and physically--for the rest of their lives, and that these documented changes provide deeper peace and understanding for all who come in contact with them. 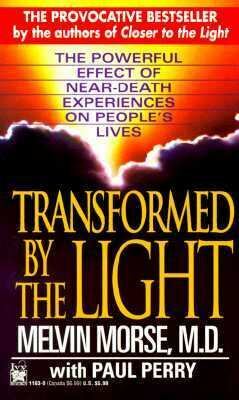 Inspirational and deeply compassionate, this book will change the way you think about the mysteries of life and death.Morse, Melvin is the author of 'Transformed By the Light' with ISBN 9780804111836 and ISBN 0804111839.